Description: Born in Anglet, France a seaside resort located between the cities of Bayonne and Biarritz in 1962. As a child, Jean-luc was a cello student ( a former student of Jacques Doué) before dedicating his life to bowmaking. In 1992 Jean-François Raffin, offered him a position to come and work in his Parisian workshop . He remained his assistant till 1997. Member of G.L.A.A.F. (Consortium of Violin and Bow Makers Art France) 1st Prize SEMA 2008 ( Société d'Encouragement Craft Art ) County and Regional. National finalist Grand Prix of Crafts 2008. Innovation Award 2008 - Eleanor Crafts. Patent at the I. N.P.I. 1st Prize "Stars and Crafts " 2009 departmental and regional - National Finalist Award " Stars and Crafts " in 2009. 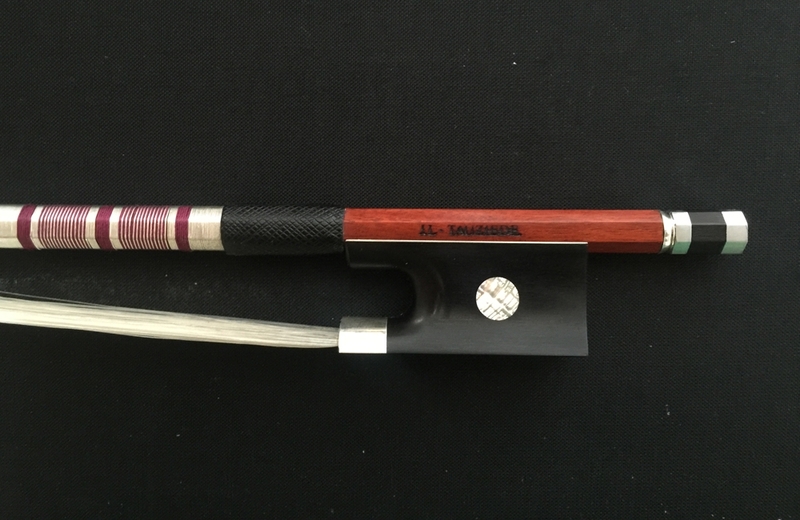 This particular bow is in brand new, mint condition and produces a powerful, smooth tone. Circa 2015. Weight: 67.9 grams.